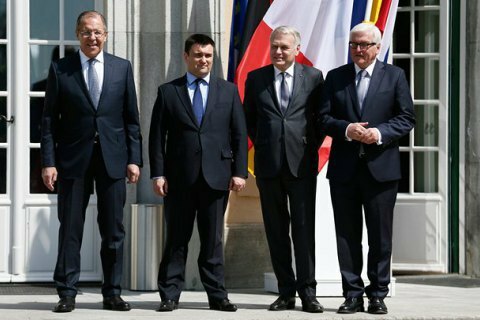 The "Normandy format" and its dynamics are working in favor of Ukraine, analysts say. The main drawback of the Minsk agreements is that the deal places the greatest responsibility for their implementation on Ukraine, while the self-proclaimed "DPR" and "LPR" are responsible only for the implementation of a limited range of security measures, says the study The Audit of Minsk agreements. The study was compiled within the Think Tank Development Initiative (TTDI), which was founded by the International Renaissance Foundation (IRF) in partnership with the Open Society Institute for Europe (OSIFE) and the Office of Communications Ukrainian analytical centers in Brussels. TTDI is funded by the Embassy of Sweden in Ukraine. "It is expected that only Ukraine is responsible for the implementation of political component of the agreements, 'Minsk-2', eg amendments to the Constitution and adoption of legislation regarding the status of the occupied territories, amnesty and elections in these areas. This creates the mistaken impression that Ukraine may on itself ensure the successful political settlement, in which Russia has numerous resources for incitement and pause," the document says. At the same time, "After nearly two years, Ukraine has reached agreements in the negotiations on the details of implementation of the Minsk agreements, which gives it a certain room for manoeuvre". The study stresses, in particular, that "Ukraine has received the support of its European and American partners regarding the "security first" approach. "Currently, the 'Normandy format' and its dynamics are working in favor of Ukraine," the authors emphasize.